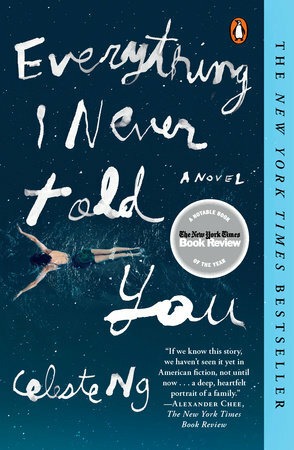 Last summer, I read a wonderful book called EVERYTHING I NEVER TOLD YOU by Celeste Ng -- you can read my review here. I adored this book, and as I re-read my review, it quickly becomes apparent that there were just so many good things about this novel. I gushed over EVERYTHING I NEVER TOLD YOU and rightly so. This novel was a New York Times Bestseller, a New York Times Book Review Editor’s Choice, winner of the Alex Award, and winner of the APALA Award for Fiction. It was also named a best book of the year by the following: NPR, San Francisco Chronicle, Entertainment Weekly, The Huffington Post, Buzzfeed, Amazon, Booklist, St. Louis Post Dispatch, Shelf Awareness, Book Riot, School Library Journal, and more! I still remember what a powerful novel EVERYTHING I NEVER TOLD YOU WAS. I loved the complexity of the characters as well as the mystery aspect of the story. And I could just go on and on about Ms. Ng's writing. In fact, this book would make the perfect book club pick, especially since it was recently released in paperback. You can check out the reading guide here. EVERYTHING I NEVER TOLD YOU was recently released in paperback and I'm thrilled to say that the publisher is providing two copies of this novel for two lucky readers. To enter, just fill out the form below before July 9th at 11:59 p.m. EST. I will randomly select and notify the winners the following day. This contest is open to those of you with U.S. and Canada addresses only. Good luck! Sounds like a great storyline, thanks for the review, it says Read Me. This one is on the 2016 list for my book club. Looks like a good one. Thanks for the chance to win it!